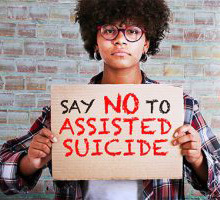 Assisted suicide promotes the idea that life with a disabling condition is not worth living. Thank you to Elizabeth Schiltz and groups like Not Dead Yet for speaking out against the discriminatory practice of assisted suicide. Editor’s note. This appeared on Mr. Schadenberg’s blog and is reposted with permission. It’s been a year since news leaked out that PPFA President Cecile Richard had officially resigned.